Portable exchange Deionizers (PEDI) and total water systems serviced by 700+ Culligan dealerships throughout North America. Culligan assures third party certification of industry standards and complete end-to-end solutions from a single source. Demi cabinets are used when the volume of water processed is relatively small. A demi cabinet should not be used on any water treatment opportunity which requires greater than 50 gallons per day on a design day. The advantage of demi cabinet is that it uses 100% of the supply water not wasting any water through the demineralization process. Reverse osmosis (RO) is used for moderate flow applications normally between 40 and 200 gallons per day. The RO system allows for higher volume of water to be treated than DI bottles alone, and will substantially reduce the maintenance requirement of changing DI bottles. The disadvantage of the RO cabinet is that the system does not have an RO pump and as such the RO design recovery is only about 30%. This means that there will be a high volume of waste water. RO design recovery is the amount of process water made from the RO plant. The higher the pressure applied to the water source the higher the RO design recovery percentage. STULZ Demi-Cabinet mixed bed deionization (DI) systems are used for the removal of ionized organic and inorganic minerals and salts from water, using a concurrent ion exchange procedure. The positively charged ions are removed by cation exchange resin in exchange for a chemically equivalent amount of hydrogen ions. The negatively charged ions are removed by anion exchange for a chemically equivalent amount of hydroxide ions. The hydrogen and hydroxide ions introduced in this process unite to form deionized water molecules. The mixed bed DI resin is housed in plastic bottles and has a nominal mineral removal capacity of 10,000 grains. A complete system consists of two DI Bottles connected in series and housed in a steel cabinet with a lockable hinged door. Within the cabinet, a water shut-off valve is provided in the supply side piping. A conductivity sensor with a 10 ft. long cable is provided in the DI water outlet side for connection to the STULZ Ultrasonic control panel for monitoring the purity of the DI water being dispensed. Water inlet and outlet connections are accessible from outside the cabinet. 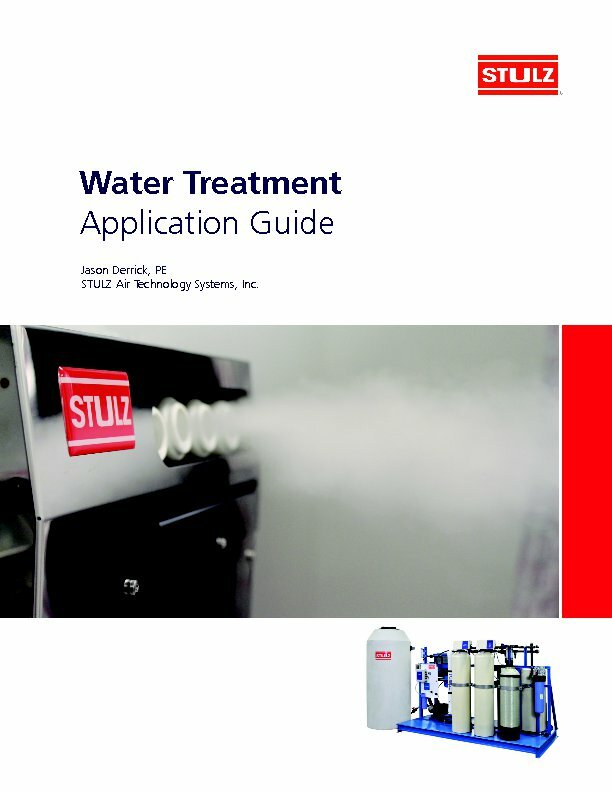 Understanding water treatment is essential in being able to properly apply a water treatment solution for STULZ Ultrasonic Humidifier Systems. Ultrasonic Humidifiers require water treatment to prolong the life of the transducers and to prevent mineral deposits in the water from being introduced into the air stream.